Ready to use coolant which can be poured into the cooling loop without further mixing or dilution. Specially developed for closed cooling loops, highly effective and long-term stable anticorrosive for PC cooling systems. Suitable for loops with multiple different materials (e.g. Copper, brass, plastics, gaskets). The corrosion inhibitors work effectively and protect your system over a long period of time. Metering is easy, as AT-Protect is filled into the cooling loop undiluted and without further mixing. To ensure proper functionality of the coolant no additional dilution (e.g. with water) is permissible. AT-Protect is non-odorous, colourfast and non-flocking. 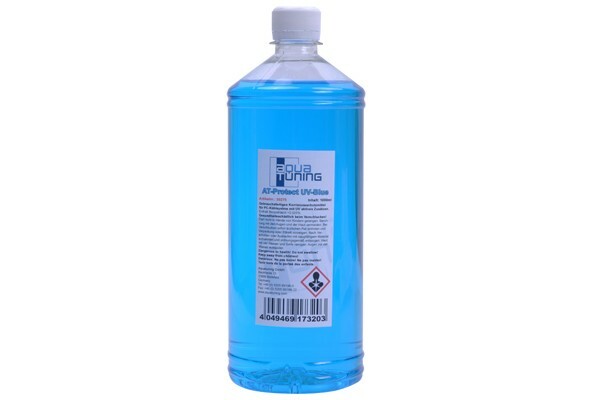 AT-Protect blue contains no Gylsantine or glycol and hence does not reduce the heat absorption of the water. It is hence perfect for use in high-performance water cooling systems. Contains Benzotriazol (non respirable). Keep out of the reach of children. In case of contact rinse immediately with plenty of water and seek medical advice. Note: Manufacturing residues in radiators may lead to unwanted reactions, hence this product must be used with cleaned radiators. As this coolant contains colouring additives, it can not be ruled out that it may stain e.g. clothing or other textiles upon contact. Please also note that colouring additives fade with time, hence possibly resulting in lessening colour intensity over time. Kann das Produkt auch für Monsoon HardTubes verwendet werden? Gibt es Alternativen? Das Fertiggemisch kann ohne weiteres für die Monsson HardTubes verwendet werden. Es können auch all die anderen Flüssigkeiten verwendet werden. Nach 1 Jahr dauernutzung wurde das System komplett zerlegt und alle einzelnen Bauteile unter die Lupe genommen. Ich kann die fertig Mischung nicht empfehlen da es sich überall ablagert und absetzt, zwar nicht so schlimm wie Pastel Farbe aber trotzdem aufwendig zu putzen. Ich persönlich nutze nur noch destilliertes Wasser mit Korrosionsschutz.